A view looking north on East Avenue in the left turn lane that seems to be on the wrong side of the freeway pylons. 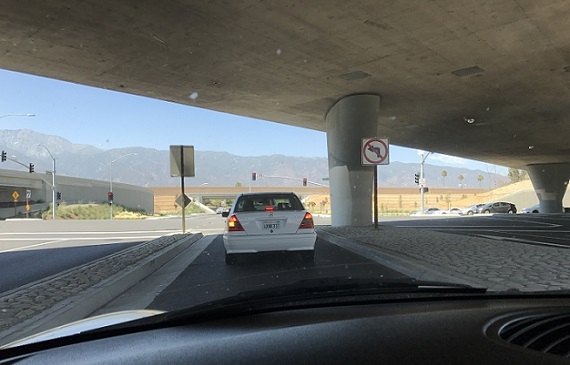 I marvel at the improved but still confounding Base Line Road interchange in Rancho Cucamonga and Fontana in Wednesday’s column, while also tossing in a list of notable upcoming local concerts and a Valley Vignette. If you’ve had any experience with that interchange, past or present, I’d like to hear about it, in hopes that it isn’t just me. Secrets Behind the Columns Dept. : I wrote the interchange item as long ago as May and revised it a few weeks later but, unsure if it was column-worthy, saved it for a rainy day. I’m on call for jury duty this week and don’t know from day to day if I’ll be working the next day or serving. Learning Monday night that I’d be working Tuesday, and thus would need to file a column by 1 p.m., I hauled the interchange item up from the depths. Will I have a Friday column or a Sunday column? Only court administrators know for sure. A few months ago, my niece and I took this thrill ride on the way to try Bigg Dane and Beale’s, on your recommendation (enjoyed it!). We came up East Ave., but missed the turn into the shopping center and had to do a couple loops before finally making it in. Makes you wonder what they were thinking when they designed the interchange, as well as the shopping center. That’s the restaurant I was trying, of course. My guess is that the portion of the center along the frontage has a different owner than the main portion and that’s why the fence. But that’s only a guess. It’s still annoying. I’ve been back to Bigg Dane’s a couple of times and it’s simpler now that I know where I’m going and how to get back on the freeway, but that initial sensation stayed with me.